For the steamships named Omsk, see SS Omsk. Omsk (/ɒmsk/; Russian: Омск, IPA: [omsk], Kazakh: Омбы, translit. 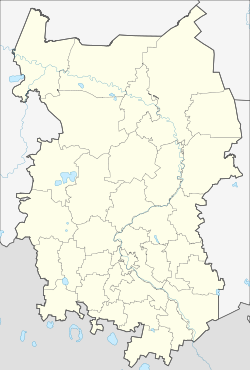 Omby) is a city and the administrative center of Omsk Oblast, Russia, located in southwestern Siberia 2,236 kilometers (1,389 mi) from Moscow. 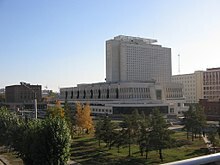 With a population of 1,154,116, it is Russia's second-largest city east of the Ural Mountains after Novosibirsk, and seventh by size nationally. 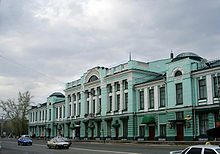 Omsk acts as an essential transport node, serving as a train station for Trans-Siberian Railway and as a staging post for the Irtysh River. Lugovskaya, Kseniya (6 September 2014). "Warrior's 3,900 year old suit of bone armour unearthed in Omsk". The Siberian Times. Retrieved June 18, 2017. 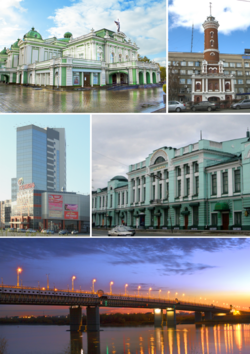 This page is based on the Wikipedia article Omsk; it is used under the Creative Commons Attribution-ShareAlike 3.0 Unported License (CC-BY-SA). You may redistribute it, verbatim or modified, providing that you comply with the terms of the CC-BY-SA.